I am the all-round logistician for the Taiz City Project. My work entails managing supplies, energy, construction, HR and finance for the project. The project supports four hospitals in the city with medical supplies, fuel, oxygen and incentives to staff. 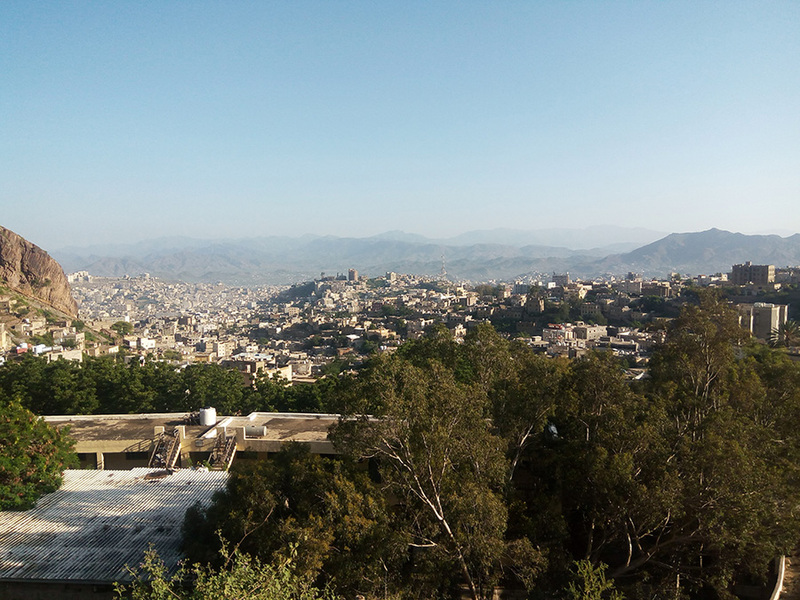 Taiz is part of the frontline of the conflict, with the pro-Hadi forces controlling the centre of the city and the pro-Houthi forces controlling the northern and western parts of the city. There are currently limited state structures within the city, resulting in the lack of basic services – most public sector salaries have not being paid for 12 months; along with lack of supplies, these are the main reasons for basic services not being delivered. We arrive in Aden airport, from Djibouti, around 2:30 pm in an MSF-chartered plane. The air was hot and thick; Aden is by the sea and so is humid most of the year. The airport is almost deserted – other than my fellow passengers; there is a small number of airport staff. I am met by a talkative colleague, the liaison officer, who helps get me through the airport procedures smoothly. The almost empty airport has an eerie feel. We drive towards the base where I will stay for one night before I continue my journey to Taiz City. The streets are deserted, apparently because the post-lunch siesta, taken to escape the midday heat, and not the conflict. The war left Aden many months ago. The Aden base is a two-storey MSF run hospital building. The consequences of cholera are evident from the front door – chlorinated water containers beside the building door and chlorine soaked pads block the entrance, forcing all those who enter to walk through it. A guard instructs everyone coming in to wash their hands in chlorinated water before entering. I rest a little then head to the roof to take a better look at the city. The MSF logo has been painted on the roof. My mind instantly goes to the news reports of the hospital attacked in Yemen and I wonder where that was. It starts getting dark and the familiar sound of the evening call to prayer bellows out from megaphone clad minarets, rippling across the city in every direction. Later that evening I am met by two members of the Taiz project team –the project coordinator assistant and one of the drivers. We spend a few hours discussing the work in the project and life in the city. I am reassured the weather is cooler and less humid than Aden. We decide to leave at 8 am as the journey will be long. Before the conflict the journey from Aden to Taiz would take two hours along a highway. Due to the conflict, this road is now closed. We are due to take the ‘scenic route’ which will take 6 to 8 hours. Checkpoints and roadblocks will pepper our route. We start our journey at 8 am, as planned. My colleagues have kindly purchased snacks for the journey. We reach the first road block and slow down. A soldier looks through the window, quickly inspecting our faces, before waving us through. I expected more thorough checks, but I am informed that it is obvious from our faces that we are not with the ‘other side’. The drive is long and the route is as scenic as I’d been promised. We drive though desert and up mountains. This part of the country is sparsely populated. We pass small village after small village. Small clusters of houses pepper the mountain side. Buildings are perched, unscathed by war, on steep mountain sides. The homes are made from the same beige, brown and black granite from which the mountains are formed. Small, flat agricultural plots form steps up the sides of the mountains. They are kept in place with stone walls of the same rocks. As we climb a steep mountain range, I am left wondering how these communities get around on these narrow roads and almost vertical slopes. During the trip up I am eager to understand as many details as possible of how life is, and has been, like in the city. My colleagues spend time describing the hardships inside the city during the siege, which started in June 2015. They recall stories of oxygen tanks, and other supplies, being carried up mountain sides, on foot, to supply the hospitals; stories of casualties and fatalities from mines, shelling and sniper fire. I am reassured it is much quieter now. A road to Aden (that we are driving on) is open, providing easier access to supplies, and the end of Ramadan has heralded relative calm. The building next to the driver’s house has been hit by a number of shells and pockmarked with antitank bullet holes. After we reach the peak of the mountain range road, we drive a little along the top until we reach a lush valley. Passing through these towns, again there are few signs of conflict; the qaat markets are busy and people are rushing around getting on with their lives. My colleagues inform me that this is the mango season and this valley is known for the tastiest mangoes. We continue past the valley and approach Taiz. The city is surrounded by mountains. We approach from the top of one side and the city is laid out in front of us. At first, it does not appear to have been heavily affected by the conflict. Piles of rubbish are strewn along certain roads, giving off a horrible stench. As we drive through the city to our final destination, my fellow travellers point out the damaged buildings. Some are pockmarked with bullet holes, a few have been damaged from airstrikes and some through shelling. My colleagues point out their flats as we drive by. The building next to the driver’s house has been hit by a number of shells and pockmarked with antitank bullet holes. His is a little shorter and has been provided cover by its taller neighbour. As I stare out the window, trying to absorb as much of my new surrounding as possible, we drive through a large gate with armed men. We have finally arrived at the hospital where I will spend the next few months.